James Hubble House hosts one of several Father’s Day’s events this year. Come, on man. Even dads need a little love, stoic as they may seem, so how about doing something on Father’s Day, which is Sunday, June 19 this year. Dads love to roar, so why not roar with the animals at the San Diego Zoo Safari Park, especially with food thrown in the man cave. A special Father’s Day buffet takes place at 11:30 a.m. at the Hunte Nairobi Pavilion. It’s described as “a delicious and bountiful buffet to celebrate Dad’s special day” by park officials. Musical entertainment will be featured along with a cash bar. Dads, and fellow travelers, will be seated at their own reserved tables, set according to their guest count. Menu includes main entrées like Grilled Jamaican Jerk BBQ Chicken, Grilled Blue Mountain Tri-Tip, Red Snapper Escovitch and Vegetable Lasagna. A Kid’s Buffet also includes major food groups like Tri-tip and BBQ Chicken. Buffet of the father day way costs $44.95 for adults, $18.95 for children ages 3 to 11, plus tax and parking. Nonmembers add Safari Park admission. For reservations, call (619-718-3000 or visit http://sdzsafaripark.org/dining-events. Dads love fishing, a lot of which results in eating fish. Try The Original Sand Crab Tavern Big Easy Brunch, a prix fixe three-course menu perfect for dads and those who love New Orleans seafood. Starters include lobster bisque, seafood gumbo, clam chowder and shrimp and crab garden salad. The second, or main, course features choice of Ponchartrain Duck Hash, Maw Maw’s Cajun Breakfast otherwise known as jambalaya scrambled with eggs, Oysters Benedict, Crab Cake Benedict, Traditional Eggs Benedict, Seafood Omelette, Eggs Baranof or Belgian Waffle. Deserts include choice of Bananas Foster, Pecan Pie, Key Lime Pie, French Vanilla Ice Cream sundae. Dad’s Day costs $25 per person. an 18 percent gratuity is added to bills for parties of six, or more diners. Brunch is 11 a.m. to 2 p.m. Or take dad a little bit later for the regular menu. The Original Sand Crab Tavern is at 2229 Micro Place. Call (760) 480-2722 for more information. Vintana Wine + Dine and Stone Brewing World Bistro & Gardens are two places many families like to take dad for a little wining, dining and/or beery celebrations with great food thrown in for good measure. Vintana is located at the penthouse level of The Centre at Lexus Escondido, 1205 Auto Parkway and offers a modern take on California cuisine along with picturesque views of the town and countryside. For more information call (760) 745-777 or visit https://www.cohnrestaurants.com/vintana. Stone Brewing World Bistro & Gardens features a dynamic venue with beautiful open-air patio and one-acre organic beer garden along with high-quality food and beer, beer, beer, It’s at 1999 Citracado Parkway. For more information, call (760) 294-7866 or visit http://www.stonebrewing.com/visit/bistros/escondido. Or you might even plan an exotic adventure by taking dad to Julian for a Father’s Day Brunch with ‘Cowboy Jack’ Johnson. The old buckaroo will be performing live from 10 a.m. to 1 p.m.on the 5 Cedar Deck at Pine Hills Lounge, 2960 La Posada Way. 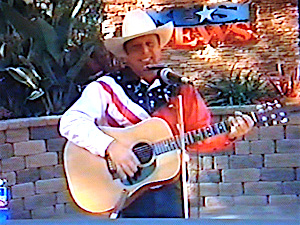 Cowboy Jack performs solo for this gig. He will be singing traditional country music from Hank Williams, Johnny Cash, Merle Haggard, Willie Nelson and more with acoustic guitar and harmonica. ‘Cowboy Jack’ Johnson is the lead singer from The Hank Show, Band in Black and is the singing cowboy for Rawhide Ranch in Bonsall. Brunch costs $15.95 for adults, $10.95 for children ages 10 and under, $5 for a highchair. Reservations are required. For more information, call (760) 765-1100. Speaking of Julian, since you might be in the neighborhood, try James Hubbell: Father’s Day Open House on Hubbell Hill. Experience renowned San Diego artist and humanitarian, James Hubbell’s hand-built, artistic mountain retreat home on from 10 a.m. to 4 p.m. Sunday, June 19. The annual Father’s Day Tour is open to the public and benefits the Ilan-Lael Foundation.There are two tour times on June 19; the morning tour will be from 10 a.m. to 1 p.m. and the afternoon tour from 1-4 p.m. Ticket prices begin at $50 for general admission, $40 for seniors (65 and older) and $30 for students (under 22) and military (with ID). Children under the age of 12 are free. For $75, attendees will receive a Foundation Supporter membership, which includes 10 percent off at the Open House bookstore, 10 percent discount for ticketed events, the bi-annual newsletter with musings and art from James Hubbell, and email alerts for art, architecture, and cultural events in San Diego and Southern California. An included shuttle service will transport visitors from Julian Station at 4470 Highway. 78 to the Hubbell home and studios if so desired. For more information, visit http://ilanlaelfoundation.org/open-house/. Be the first to comment on "Celebrate Dad’s Day in the dad’s way"